Can Bamba be the Sol-ution for Leeds United in derby? New signing Sol Bamba could face a baptism of fire if he makes his Leeds United debut in the West Yorkshire derby at Huddersfield Town on Saturday. Experienced World Cup defender Bamba, who has arrived at Elland Road on a six-month loan deal from Palermo, is in contention to go straight into the Whites side with Italian centre-back Giuseppe Bellusci banned following his sending off against Bournemouth last Tuesday and with doubts about the future of Jason Pearce at Leeds. United are expected to turn down a bid for Pearce from relegation rivals Wigan Athletic, but although head coach Neil Redfearn wants to keep the player his long term future at the club does look in doubt after he has lost the captaincy and his place in the team in recent weeks. Liam Cooper would now appear to be first choice centre-half after being handed the captain’s armband and it will be interesting to see who is chosen to play alongside him at the John Smith’s Stadium on Saturday. Bamba certainly is the type of big centre-back United have been looking for, but his lack of match practice could be a problem after he has struggled to find a way into the Palermo team this season. However, he has come to Leeds to try and revive a career that was still going strong only last summer when he played in all three World Cup games the Ivory Coast side took part in and Redfearn is pleased with his arrival. If Bamba is chosen for the Huddersfield game he will join a Leeds side buoyed by completing a double over Championship leaders Bournemouth. United may have rode their luck a little to win 1-0, but the vital win made it three games unbeaten and gave them some much needed breathing space away from the bottom three, putting a six-point gap between the Whites and 22nd-placed Millwall. They now face a Huddersfield side that has hovered round the relegation zone all season, but who are also showing signs of revival. They had a big win at Wigan last Saturday and with three victories in their last four league games Chris Powell is slowly stabilising the Terriers. Town stand five points and five places above 20th placed United and were well beaten at Elland Road back in September so will obviously be up for a revenge mission on a ground that is always difficult for Leeds. Huddersfield player Conor Coady indicated how much it means to the Terriers when he said this week that their defeat at Elland Road had been their worst day of the season and there was determination to put that right. He said: “They didn’t see the real Huddersfield Town at Elland Road. “We’ve spoken about it before and we hated it as a club, as a team. 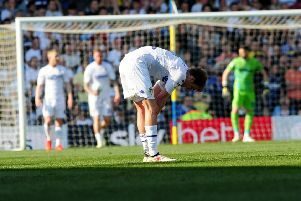 “It was the worst day of the season by a country mile so for us, (Saturday) is about amending the errors that we made at Elland Road.